Bisquick is my very good friend in the Exile’s Kitchen. It is great for more than just biscuits and pancakes. I love to use it for the base of easy cookie making. 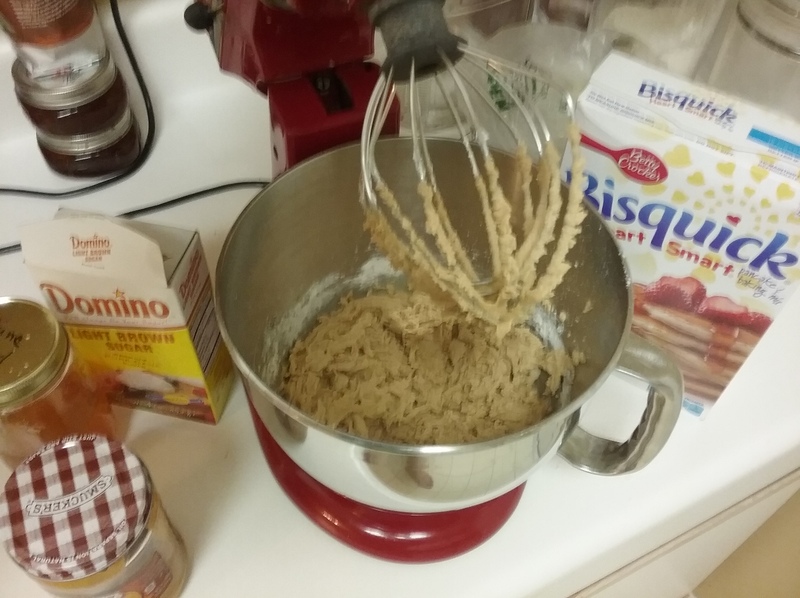 Following is my quick recipe for peanut butter cookies. They’re not overly sweet or crumbly (as some can be). They’re perfect with coffee. They’re just perfect- period. I use a muffin top pan for these cookies; it’s one of my favorite things and if you don’t have one, I suggest that you buy at least one. Spray the pans individual cups with vegetable spray and preheat the oven to 350°. In a stand mixer, using the whisk attachment, cream the butters together. Add the egg, brown sugar and honey till it’s well mixed. Next add in the Bisquick, being sure not to over beat. The cookie dough will be stiff. There’s no need to refigerator this cookie dough, like some peanut butter cookies recipes. 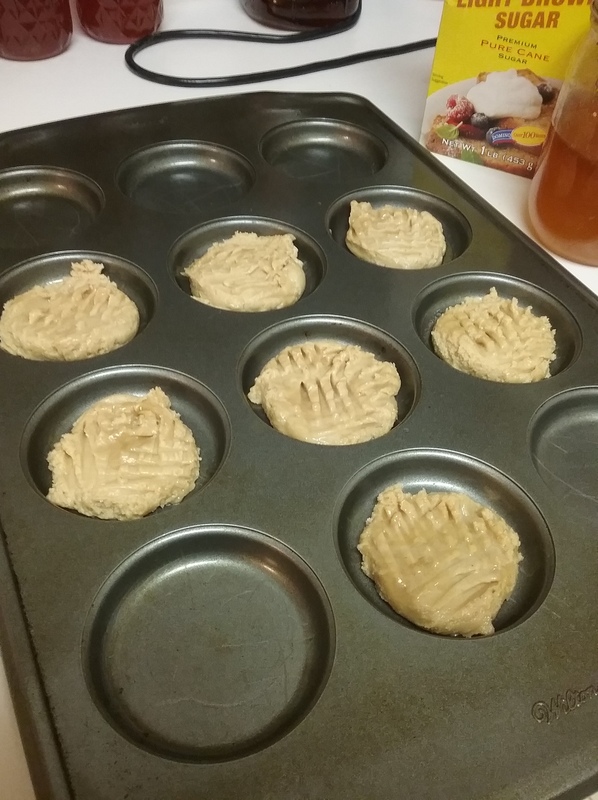 Using a small cookie scoop, drop a mound of dough into each individual cup. Dip the tines of a fork into cool water and make the traditional crisscross pattern on top of each cookie. 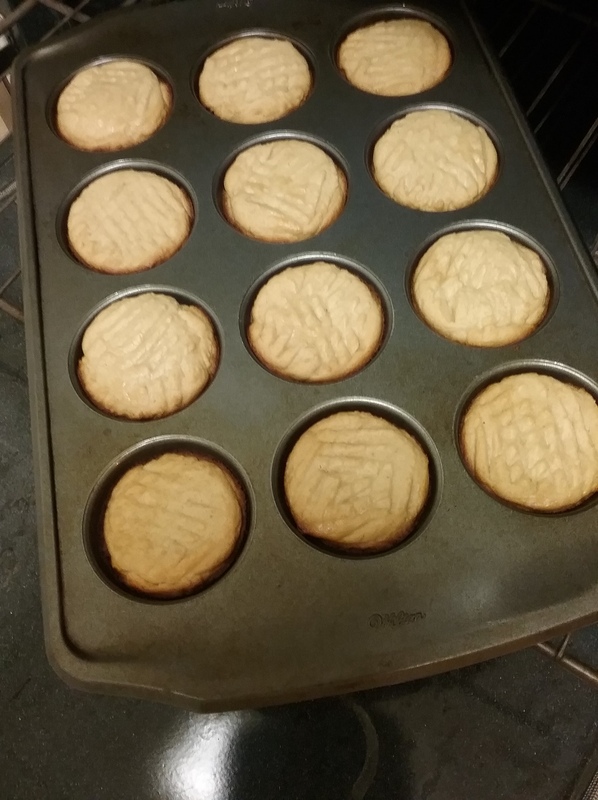 Can’t have peanut butter cookies without the pattern on top. Place the cookies in the oven and bake for 10 to 12 minutes or until the sides are browned. These cookies will spread to the edge of each cup, making perfect rounds. Cool them slightly, before taking an icing spatula to pop the cookies out of the pan. If you want them to crisp up, cool them on a wire, baking rack. I like to cool them on a plate; they stay a little chewy that way. Makes about 1 1/2 dozen. These never stay around long in The Exile’s Kitchen. Now, where’s my cup of coffee?